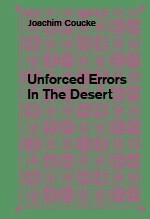 Unforced Errors In The Desert is the first publication on the eponym work of artist Joachim Coucke (°1983, Kortrijk). The work consists of fake palm trees, cables and internet modems, and is a permanent installation at Liebaerts Projects in Kortrijk (B). This publication was made on the occasion of the Provincial Prize in Visual Arts of the Province of West-Flanders (B) in 2014. The book Dutch and English texts written by Oscar van den Boogaard and Wim Waelput. The book comes with a show held at Be-Part, Waregem from December 19th til March 1st 2015.